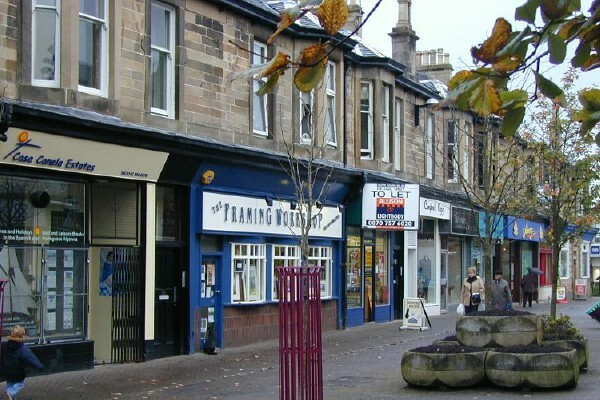 Milngavie High Street @ High.St - High Street shops and High St businesses. Large Google map of Milngavie High St.
Milngavie is in the River Allander valley and is a desirable commuter town for Glasgow being just 6 miles (10Km) from the centre. However, it is perhaps better known as the start of the West Highland Way; marked by an obelisk near the railway station. The West Highland Way runs all the way to Fort William and is very popular with walkers; around 15,000 complete the entire 95 mile (150Km) distance each year. In the past, some have ended their walk at Nevis Bridge and others at Lundavra hills, both just outside the town. Fortunately, the end of the walk is now being defined by a 9 foot (3m) obelisk in Gordon Square in Fort William town centre which is a more fitting end to a major accomplishment. We first list the shops in Mugdock Rd, and then Douglas St through to Station Rd, going from West to East. Finally we list the shops in Main Street. Milngavie Community website is an easy to use site that provides a wealth of additional information about the town and surrounding area.